I set out originally to make a Double Wedding Ring quilt because of the DWR challenge, which at that time had just been announced. 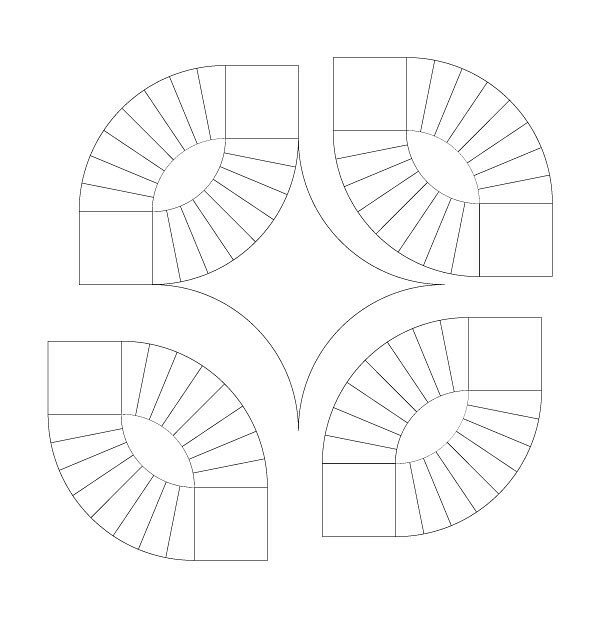 In planning my quilt, there were a few design elements I knew I wanted to incorporate: thick arcs with fewer and thicker wedges, paper pieced arcs, an entirely pieced quilt top (no applique! ), and big scalloped edges. I was also hoping to not have seams in my background pieces. 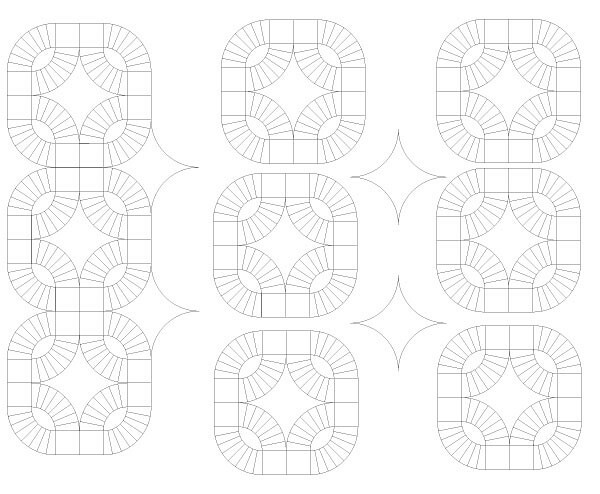 My first resource to share is this DWR pattern. I actually started a red and white DWR using this pattern but I didn’t get too far. If you are making a pickle dish quilt, you would find that pattern helpful in how it explains the cutting of the background pieces. 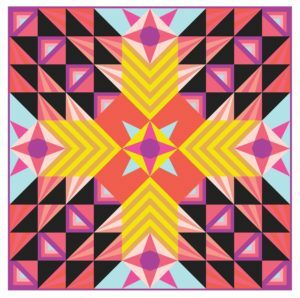 Once I brushed up on that pattern, I set about drafting my own pattern pieces using my newly acquired Adobe Illustrator skillz. 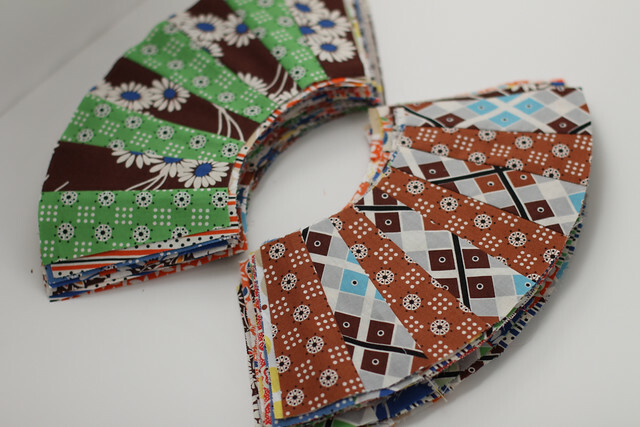 Once the arcs were all pieced and trimmed and de-papered, I sewed the arcs and squares into the oval units. This tutorial is pretty much what I did except I pressed my seams toward the center background (football or oval) piece. I clipped some of my seams thinking it would make the curved seams lay flatter, but I couldn’t tell a difference between the units with clipped seams and unclipped seams. So I abandoned the clipping. 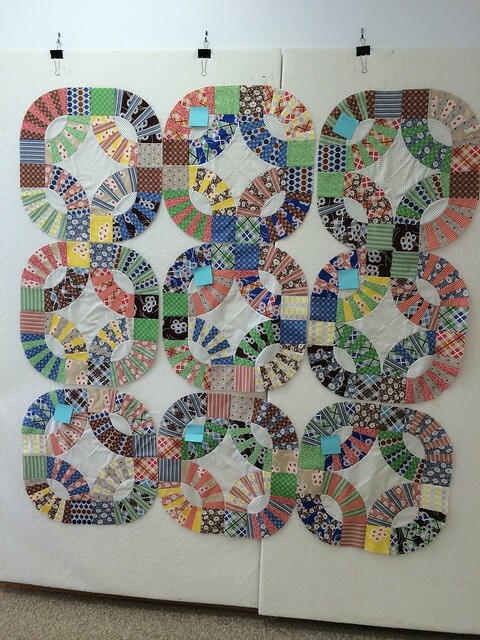 Then, once I had all my oval units pieced I laid them out into blocks. 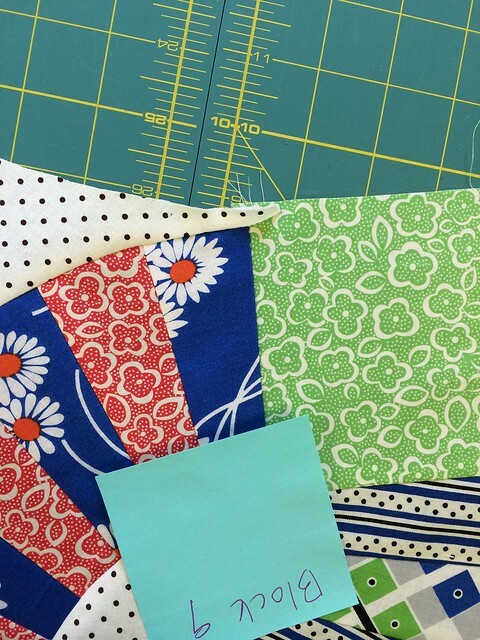 This is about the time when I figured out maybe I wasn’t making a DWR because my piecing was not going to resemble any of the DWR tutorials or patterns I found. To be honest this was when I kinda had an “oh crap” moment. Here’s when I realized an important difference between the DWR pattern and the Pickle Dish pattern. The arcs in the DWR point up and down and side to side. 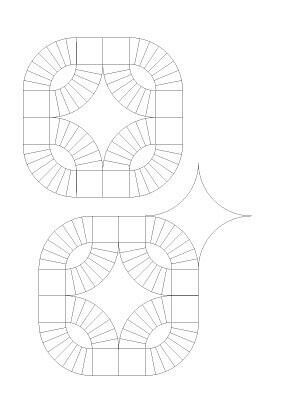 The arcs in the Pickle Dish pattern are set on the diagonal. Oops. Here I thought they just had philosophical differences as to the thickness of the arcs. 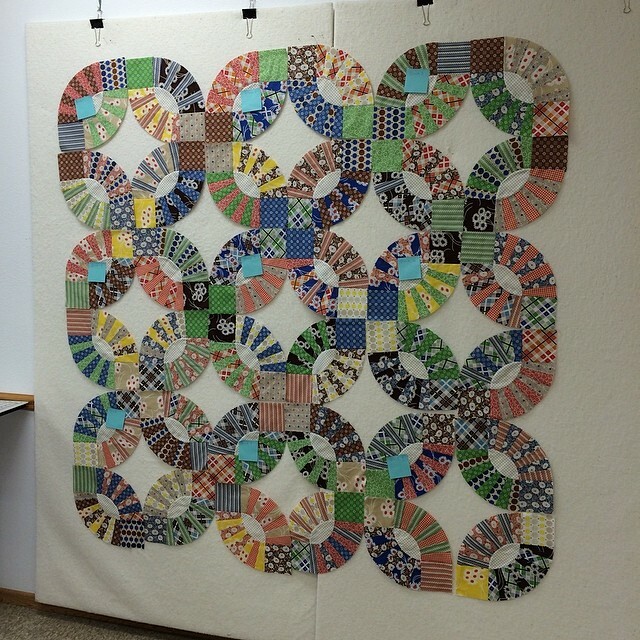 Well, I didn’t have enough fabric to make more arcs to finish the quilt as a DWR so, I set it aside for months. That’s what you do when completely puzzled and bit tired of yourself. So, finally at my quilt retreat a few weeks ago I laid out my blocks again. 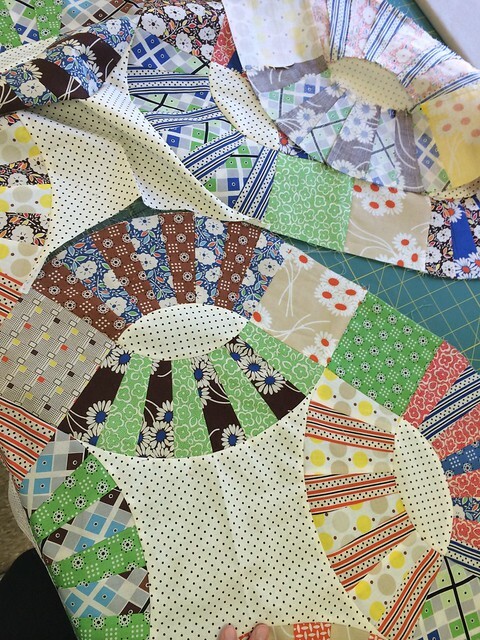 And after reading Aneela’s Pickle Dish quilt along in it’s entirety, I decided that the blocks could at least be pieced with a whole center and pieced outer parts, like so. So first I pieced each block. 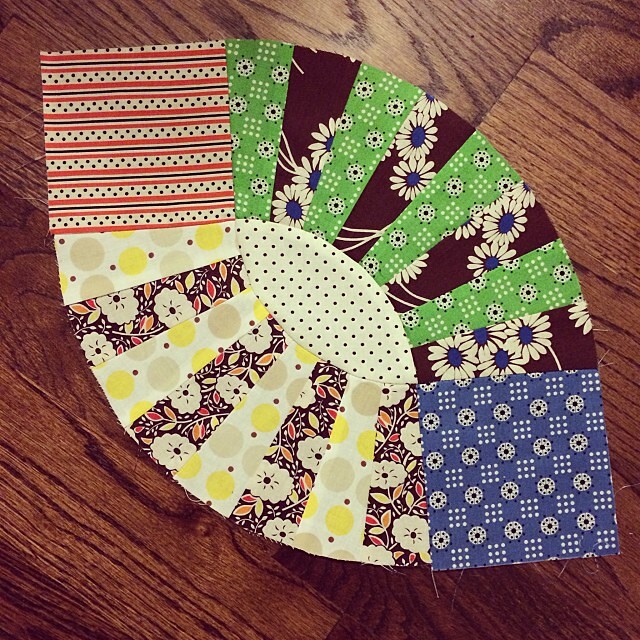 I pieced it like so working with one oval unit at a time and clockwise. The key here is to keep the seam allowances free, as you would with a Y-seam. In other words, start and stop at the seam intersections. Be sure to back stitch. Then, I pressed the free seam allowance out of the way a bit. Then I laid my 9 blocks out again. Moment of truth the 4 remaining background pieces needed to be sewn to make this baby a quilt top. Still bubbling through, this is what I did. First I sewed the left blocks together. 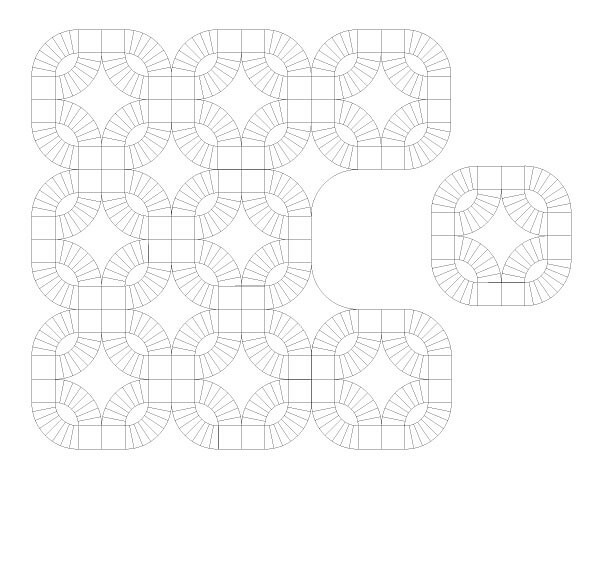 Below is how I pieced the blocks together. First I sewed a block to the lower left of a background piece. Leave the seam allowances free again. Then sew a block to the upper left. Seam allowances free. LACES OUT DAN! For the middle row, I pieced the top and bottom blocks first. Then I pieced the middle block with a continuous seam, no stopping and starting. I can’t remember the exact order I pieced the final row in, but for me it involved 2 true curved Y-Seams. Here’s a picture of my last seam. See how the 4-patch on the left is already sewn together backstitching at the seam? Perhaps piecing the last row like I pieced the middle row would have been better? Then you have a quilt top! If you don’t want scalloped edges, you could fill in the background pieces on the edges. Ok, my biggest tips are 1) mark the center lines of each piece for easier pinning, 2) leave the seam allowances free and 3) when joining the blocks, pin the free seam allowance out of the way. 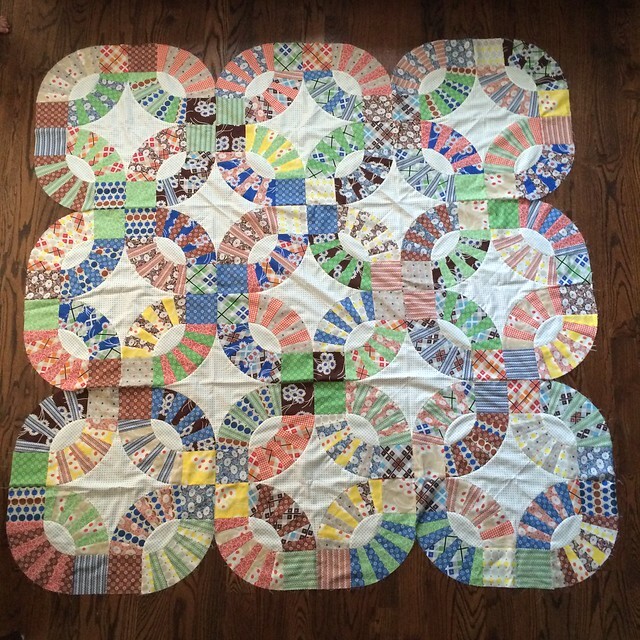 Although making this quilt top intimidated me greatly, I would love to make another. Then maybe I could more accurately describe with pictures what I did! 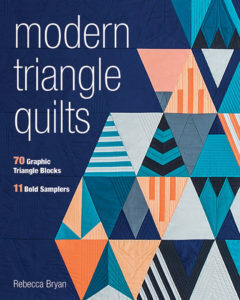 First though, I *should* quilt this one. I’m thinking I’d like to hand quilt it, so I’m back at the intimidation phase. But this quilt deserves a great investment of time. I’ll answer questions in the comments. Becca — this turned out really cool looking. You did a great job with the piecing! Such a deep V on the edge will certainly make binding a challenge. Alternatives might be a facing or even a pillow-case approach (sew, turn, then quilt). Most of the images I've seen square things off with more background and then some add a piano key border, or scallop the additional background (more undulating with no sharp corners). Yours is certainly unique. 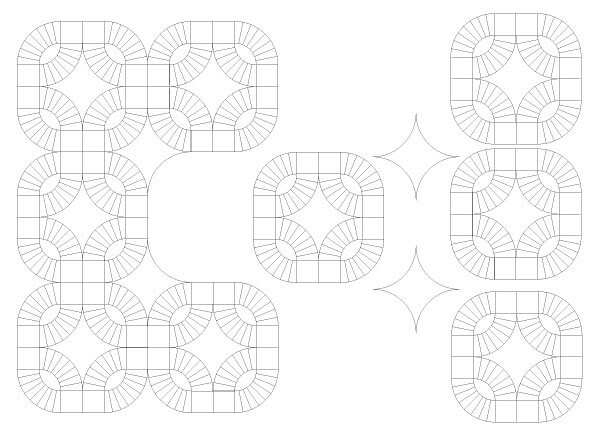 For quilting, you might consider combining machine quilting (ditching around the arcs, etc), and hand quilting (nice visible motifs in the backgrounds) where it will show. I have totally pinned this for future reference whenever I decide to tackle one. Thanks for including all of the previous posts and tutorial references, that is super helpful too. I do agree with the commenter above about the deep V's; but I know that you will rise to the occasion and figure out something wonderful. I've fawned over this quilt all along, so I'll just say, Well Done, You. Thanks for sharing your tips; I hope to make use of them someday. Well, I tried to give this a go, without piecing the background. I thought I had worked out a method to press my seams in a consistent manner, but I'm running into issues. There are places where it seems I must press a seam first in one direction, then another; except there's no good place to make the transition. I'm thinking I may need to clip the seams. Did you run into that? 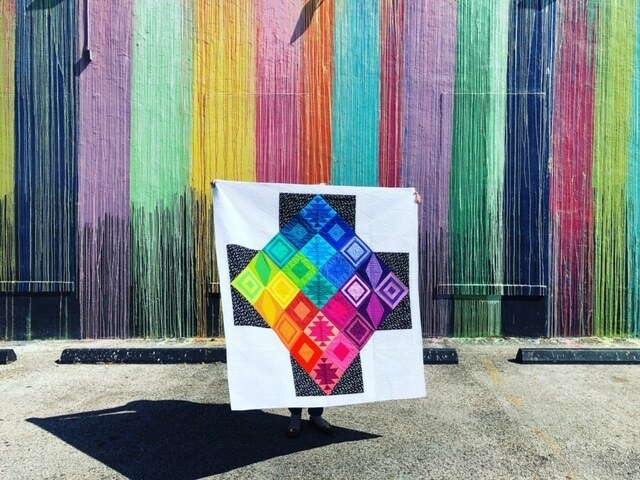 I think this was the quilt you were handquilting on Saturday at Janie Lou? I wish you lived closer as you have a lot to share. I read your book cover to cover. 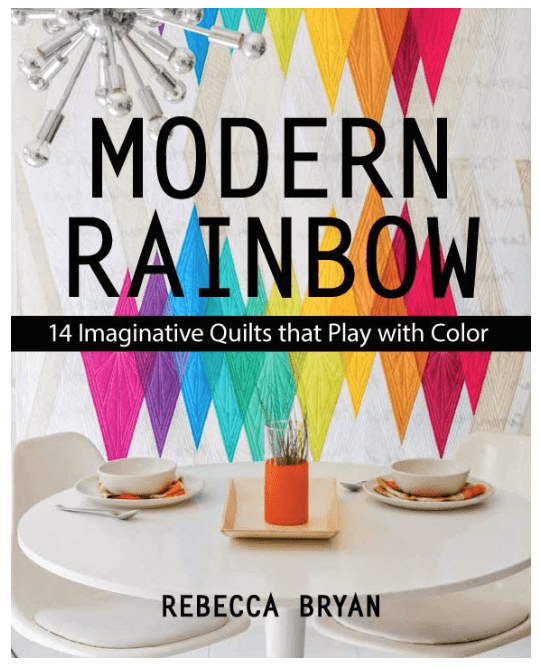 I have the idea to combine your rainbow coloring in a Sujata Shah (Cultural Fusion book) type rail fence quilt. I would also like to make your circular hexie color wheel one but it kinda intimidates me. I’m starting to do a pickledish quilt and this information has been very helpful. The only part I haven’t figured out is how to do sew the cornerstones. Is it a Y seam? Every link I’ve come across to the Comfort Stitching Blog sew-along comes up blank so I think she has taken the post down. Any tips? Thank you! Yes, I think they are y-seams. At least mine are. I want to say that the Comfort Stitching version is a little different than mine though. Hope that helps!